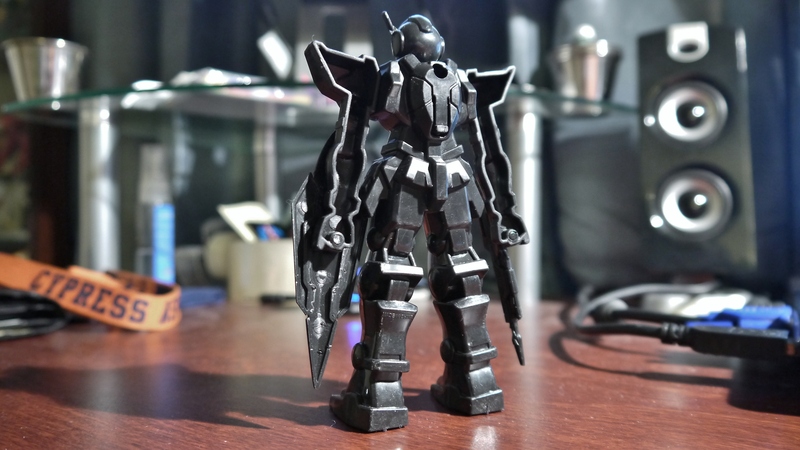 What Is This Black Exia Magic? So funny story, the other day I was at the Dollar Tree near my house shoppin’ around for any Valentine’s Day memorabilia. I was hastily pacing through the aisles when something caught my eye: a funky, cheap-looking robot figure hanging in the toy section. At first I dismissed it as another cheap piece of the Dollar Tree, but then I doubled back for a second look. 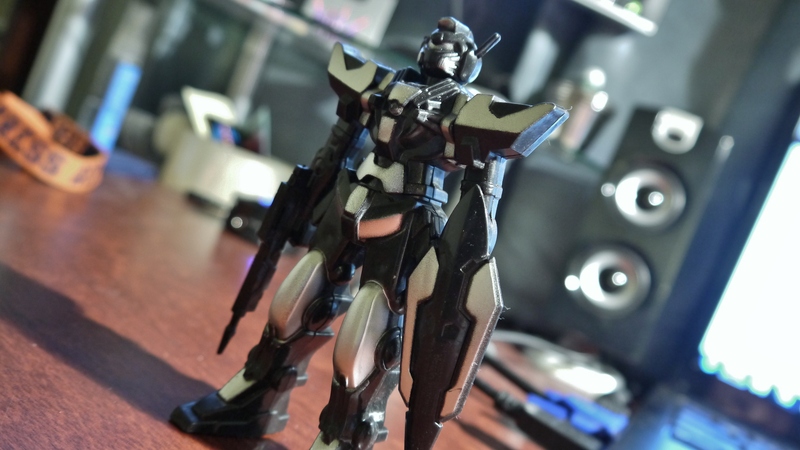 Maybe it was my imagination, but was that Gundam Exia’s shield…? It was. Not just the shield, but most of the robot itself. I instantly recognized it as one of those cheap, fourth-party knock-off toys that you see all over China Town. Never thought I’d find it in an American retail store though. 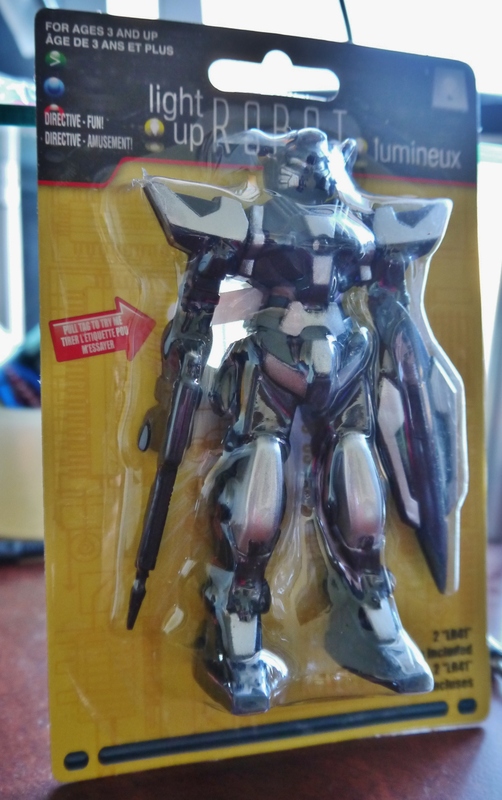 Looks like Gundams are now sold in the States! Huzzah! Naturally this thing is insanely cheap. I figured I’d shell out a dollar and pick this thing up just for kicks. 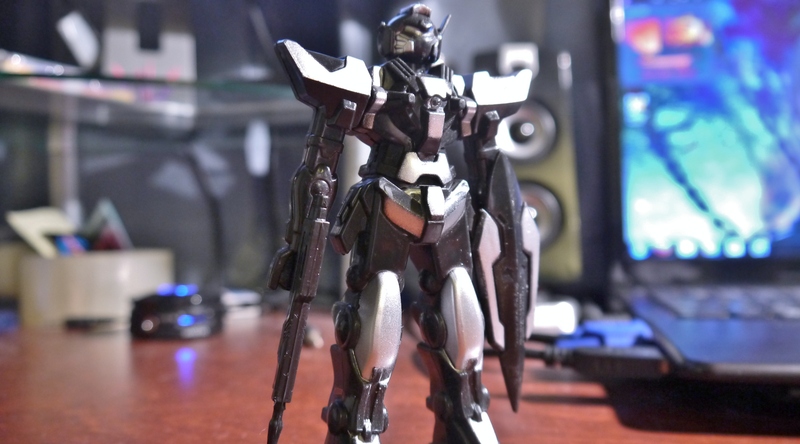 It’s essentially a statue, with most of the mold ripped from the Exia. Gahahahahahaha the entire backside is hollow! Plus the arms are turned forwards funky..oh man it doesn’t look too bad from the front but from the rear it might as well be an ice-cube maker. 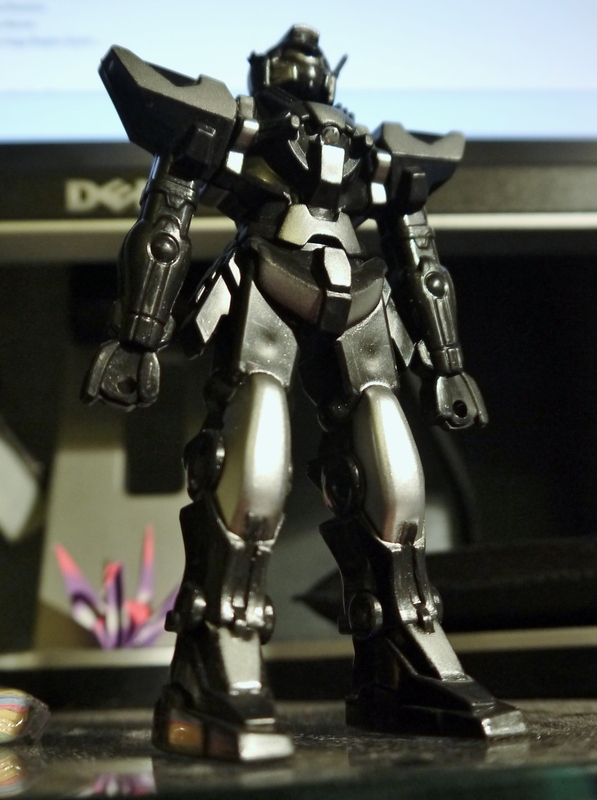 You get some weird amalgamation of the Exia’s torso, shoulders, and the sides of its arms turned forwards. 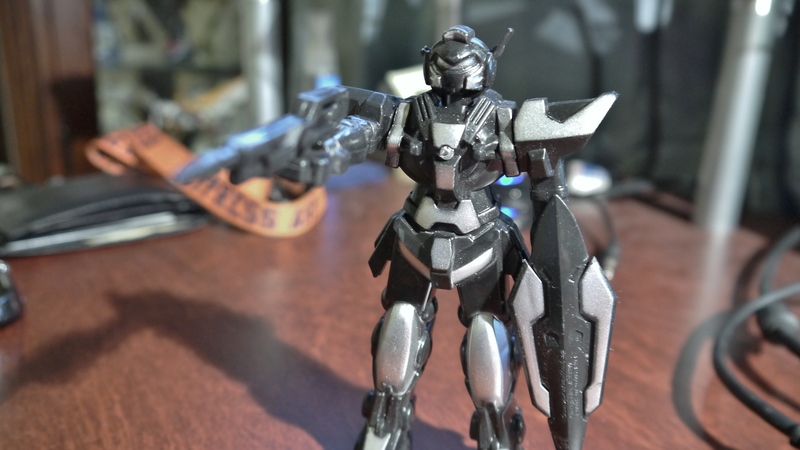 It looks like this whole thing was molded in a funky (definitely not Bandai-style) black plastic, and it seems an attempt was made to add silver highlights. The head seems to be some form of an original design, or just ripped from a ‘bot I’m not familiar with. 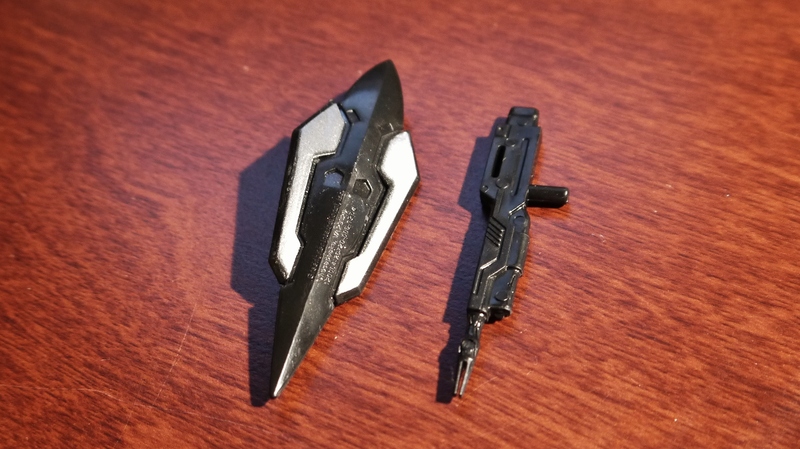 Surprised they didn’t just straight-up go with Exia’s head and sword. 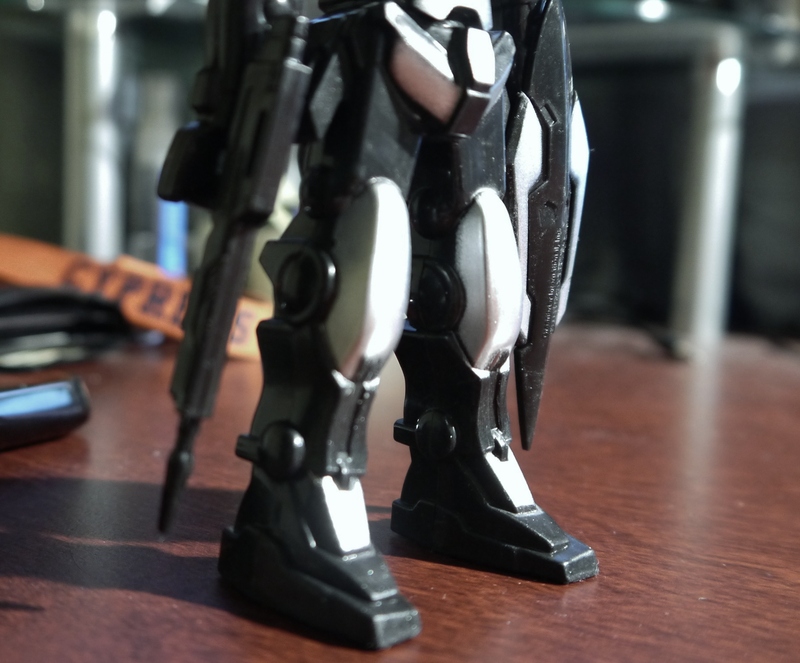 The legs are also generally the same design as Exia’s, only chubby as fudge. Then, of course, you get the easily recognizable shield, and a 2D rifle ripped from I don’t know where. The shield can only be held facing forwards by plugging into the palm. It looks incredibly odd like this but I guess the designers didn’t get the memo that mobile suit shields are usually mounted on the side.. I think the main selling point of this…thing…is the included LED light-up feature. 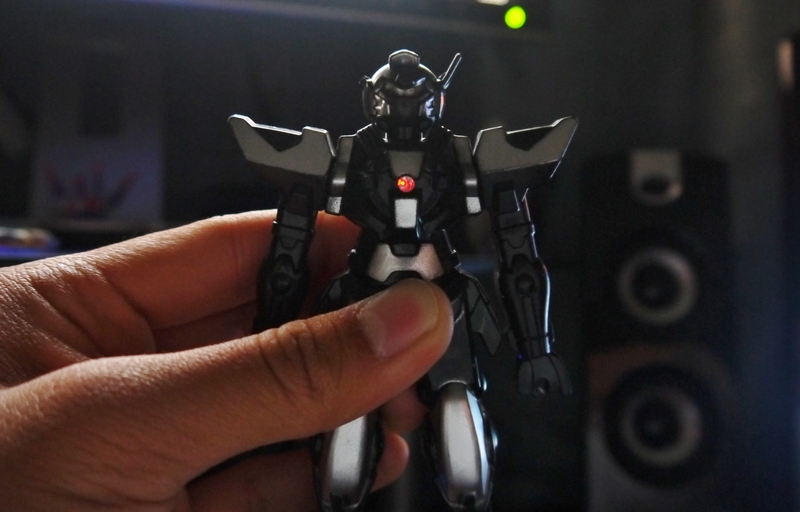 It’s advertised as a “Light Up Robot” after all. Then I stared harder, went into my pitch-black closet, stared even harder, and I saw the light. The above image is legitimately how bright that thing shines. It’s like…I could rub plastic together and create a spark brighter than that. About the weakest little red dot I’ve ever seen. But then, I seriously didn’t expect much for my buck. Thought it to be a funny venture when I first saw this thing. Now that I actually have it, it might feel like a waste throwing it out, so maybe I’ll use it as a paint tester or a campfire, depending on which is more urgent at any given time.